I’ve always liked paint-by-number paintings, but have terrible luck at finding them on my antiquing and garage sale trips. 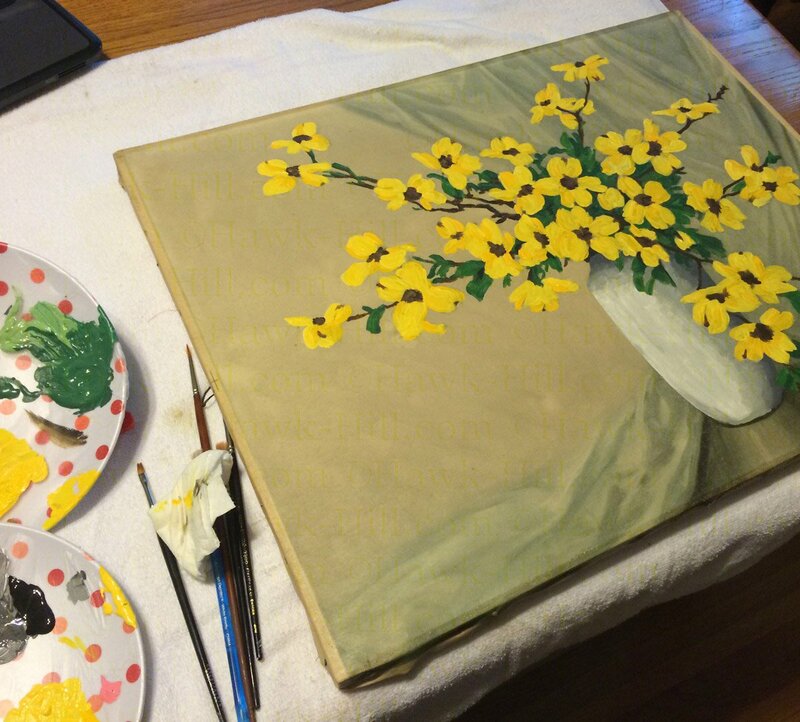 When I saw Ashley’s post about creating your own paint by number painting, I was excited to give it a try and kept my eyes peeled for a good candidate. 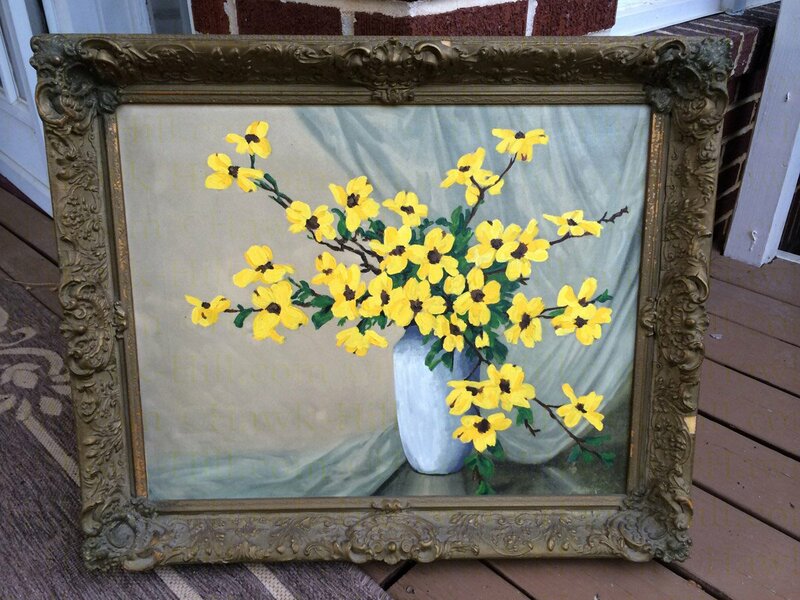 When I found this lovely frame and sad painting for $15 at a remarkably eclectic garage sale in a notably borning subdivision, the badly faded canvas seemed like a perfect victim for this kind of reckless artistic experimentation. No Filter! It’s interesting to think where this painting must have hung to be in this shape! 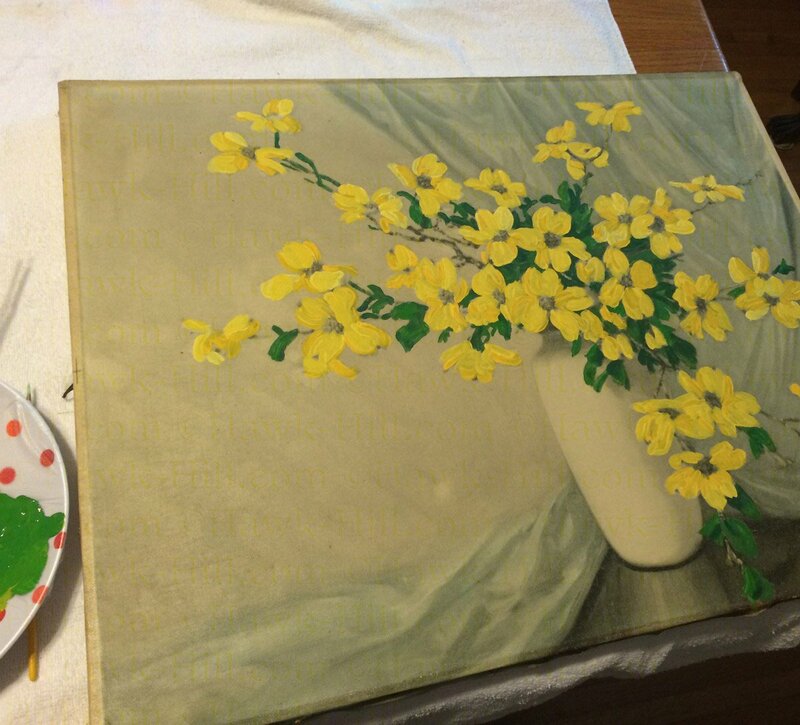 I jumped right into adding paint to create my own paint by number over the original artist’s work. Actually, I did have to pause for a bit- because to my horror I ripped the canvas as I was removing it from the frame! I almost scrapped the project then, but decided to apply some butchers tape to the back and hope for the best (Butcher’s tape is Kraft paper tape with water-activated glue on the back). My high school art teacher was a huge fan of this tape for paper and natural fibers and I guess I adopted that. 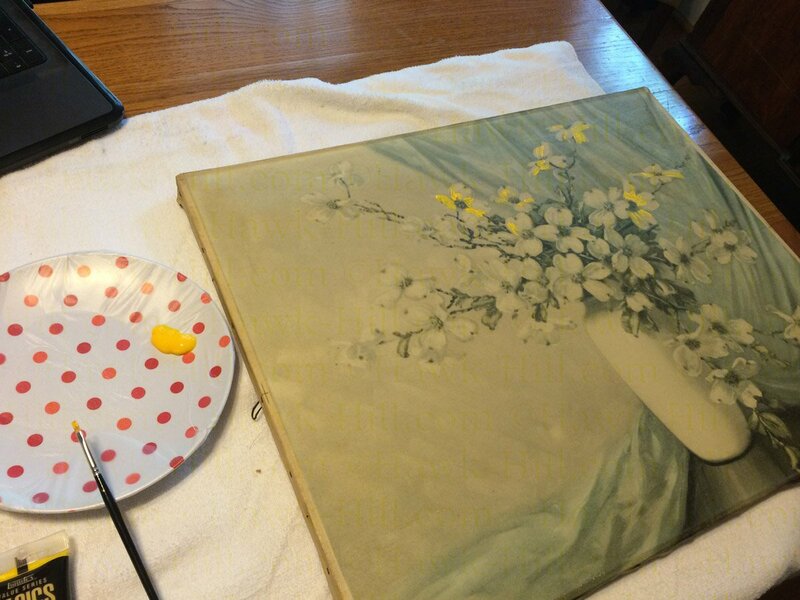 Turns out, it worked great for gently repairing this canvas from behind. I expected to have to paint over to hide the rip on the front, but after the tape dried I couldn’t even spot the 2″ tear unless I hunted for it! 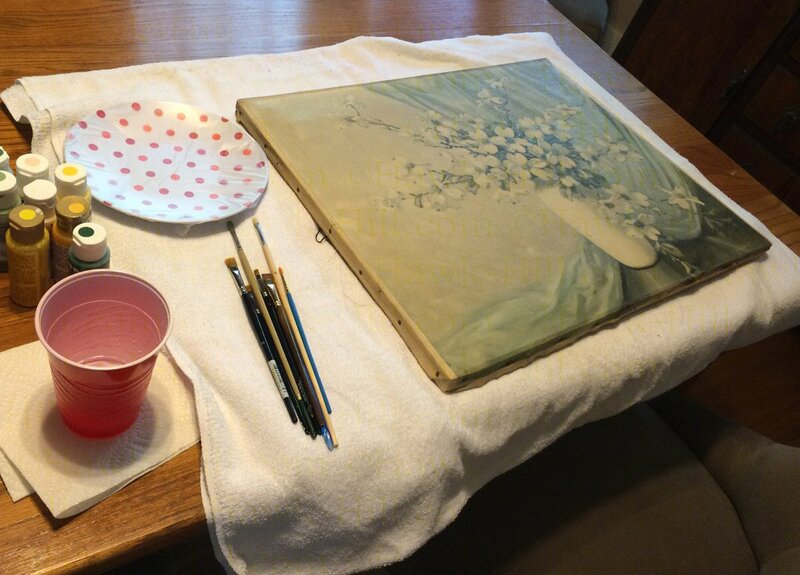 How I stage art night at my dining room table! …and though it didn’t turn out exactly like I planned (does any art project?) I am pleased with the final result! Truthfully, I’m the queen of the technical aspects of painting (shading, highlighting, etc) so this method of not blending colors nearly killed me, but ultimately I liked it enough to hang it in my dining room. 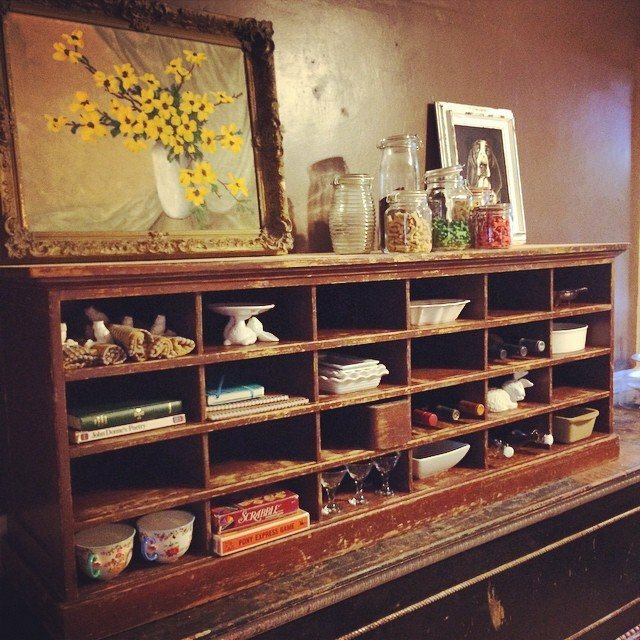 My fake paint by number, at home on top of a vintage teachers mailbox cabinet. My handy tip for this project, and all small painting projects: Press N Seal! I previously used flimsy plastic plates for palettes, but one day when I was out of plastic plates I decided to try press and seal over a plate and it worked perfect! Easy cleanup and a sturdy, easy to grip palette. I didn’t realize from Ashley’s original post that you’d take the print out of the frame before painting. 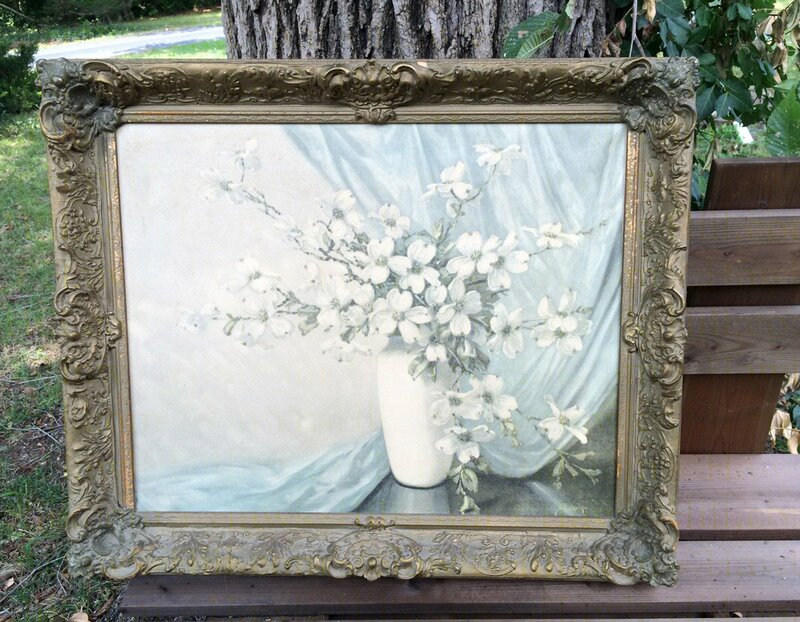 If the frame was old/shabby,I think I’d leave the painting in the frame and touch it up, too.Did you get your white floral picture at Goodwill/Salvation Army? I can’t wait to try! And how much did you spend on paint? Yeah! I loved, loved, loved the frame- so wanted to make sure it didn’t get any paint on it! I picked this one up at a garage sale- I think I paid $25? I’m usually super-super cheap, but I thought the frame was unique enough to warrant a little splurge. I just used paint I had on hand, so consider it more or less free. 😉 The nice thing about doing a paint by number style is that you do not need lots of colors. I think I just used white, yellow, and brown.